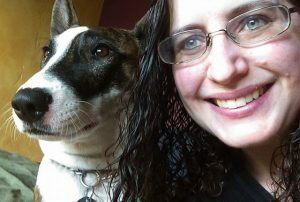 Online Business Writing instructor Julie Moss and her rescue pup Bryn-Lilyth. This spring, SDSU’s College of Extended Studies’ will offer a fully online business writing course, making it easier than ever to master your ability to craft clear and concise communications on the job and in life. The course starts March 5, and in just four weeks of 3–5 hours per week, you can forever change your approach to writing. Instructor Julie Moss, an instructional designer at UC Berkeley School of Public Health, is eminently qualified to be your guide. “I have taught professional and technical writing on two continents, as well as across all time zones in online format to the diverse U.S. military community, including active-duty service members, family, and contractors,” said Moss. SDSU’s online Introduction to Business Writing course uses workplace scenarios and interactive tutorials to teach and reinforce best practices for digital communications. Moss answered a few questions about the course and her career. I have a B.A. in English, an M.F.A. in creative writing, and an M.A.Ed. in educational technology. I have taught/tutored college English since 1995, teaching online since 2004. My professional experience includes two years with a market research firm in Tokyo, two years teaching full time on a Navy base near Yokohama, six years running the TRiO Project writing center at SDSU, and 2.5 years as an instructional designer with SDSU’s College of Extended Studies. How did you come to be and instructor with SDSU’s Business Writing program? I have a long history with SDSU, including a master’s degree in educational technology, six years with student affairs, and 2.5 years developing online courses for the College of Extended Studies. My background is in writing, with a specialty in nonfiction and technical prose, so I was excited to have an opportunity to teach this course with CES. Tell us a bit about the new online Business Writing course. We live in a digital world now, and the workplace is certainly no different. People often underestimate the importance of technical communication for building a professional reputation: from internal-office emails to online presentations for clients to posting on social media, a professional reputation is built and maintained through an ability to communicate effectively in writing. This is true across all industries and job functions. Even so, schools often don’t teach basic grammar skills and written etiquette, leaving people struggling in the workplace without the necessary skills to express themselves effectively in digital communications. Do you think even people who consider themselves good writers have something to learn? I have always said that writing is a process. No work of writing is ever complete. Even the most successful published writers have editors polishing their work. Yet, most of us write under tight deadlines with no professional editors to review our work. This course aims to provide learners with a toolbox of strategies to be confident workplace writers. Do you think fear of putting words on paper is right up there with fear of math? I would actually say it’s often a greater fear because writing is much more personal than math. Even in workplace documents, writers call upon their own viewpoints and vocabulary; it can be intimidating to feel evaluated by those measures. What are the top three takeaways from the courses? Do you have a funny grammar anecdote? I don’t have a great anecdote, but one of my favorite titles of a book about grammar is “Eats Shoots and Leaves” which means something completely different if you punctuate it: “Eats, Shoots, and Leaves.” Commas matter! One of the course topics is learning professional techniques to overcome writer’s block. Can you share one? Absolutely! Free association: write down a word and then write down everything it makes you think of. For example, I could write down “ice cream” and then free associate words like “summer,” “freedom,” “sugar,” and so on. At some point, I realize I’ve written down enough terms to write an entire essay on the topic of ice cream. The online Introduction to Business Writing is March 5–30. Enroll by Feb. 19 for an early registration discount. Visit neverstoplearning.net/businesswriting.